Sixteen-year-old Nathan is the new kid in high school. One night while attending a party he falls in love with Louis, a boy in his class. Sneaking away from the crowd, they find themselves out of sight, and eventually work up the courage to kiss each other--but someone takes notice. Soon a picture is published on Facebook, and a storm of bullying and rejection takes over their lives. Guaranteed to ship today if ordered within the next 3 hours and 1 minute. This movie pulls no punches (literally!) in telling the coming out stories of Nathan and Louis. Their clandestine kiss is photographed and posted on the Internet. For the next hour and 20 minutes we're shown the verbal as well as physical taunts of classmates, the concern of teachers to watch the suffering, and how parents succeed or fail at coming to grips with the revelation of a son's gayness. Excellent plot, beautifully filmed, and well acted. In Didier Bivel's "Hidden Kisses" we meet Nathan ( Berenger Anceaux,) 16, who lives alone with his father Stephane (Patrick Timsit). Nathan is a new student at his school and he is invited to a party where he meets Louis ,(Jules Hoplain), a boy in his class. They soon are away from the others and share a kiss but someone manages to take a picture of them that winds up on and they face bullying and rejection. Louis, comes from a highly successful family whose values are rooted in beliefs of the past (for Western Europe). 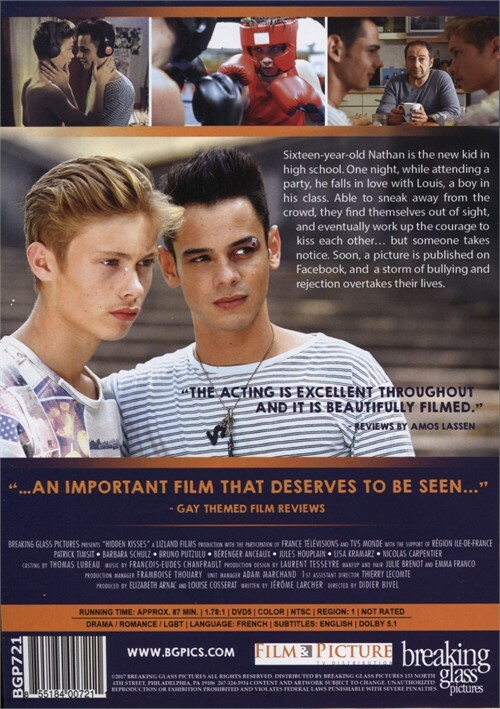 Even though Louis is the young man also photographed kissing Nathan, it is only Nathan's face that is clearly seen and recognized by his peers and his widower father.While Stephane (Nathan's Dad) struggles with the idea of having a gay son to raise all alone, the situation is quite different in Louis's household, where his father, who is also his boxing coach, finds the idea of gays abhorrent and something to be changed, even if it takes bullying and violence to accomplish it. As this movie unfolds, and Nathan faces the very hostile and violent bigotry of his school mates. There are a few sympathetic teachers who want to help him, but they seem to be cowed by an administrator who is more worried about having to deal with angry parents who don't want homosexuality anywhere near the school and their children. It seems to me that the story looks back to a time when almost no one in the community helps the gay kid who is beaten up by a group of bullies in a locker room. On the other hand, however, Nathan's father accepts him in contrast to Louis' family. The good news is, that although things aren't perfect, this movie has a happy ending for the boys- and we can see that they will survive the homophobia of the world. The kind of cruel world we see here still exists, even with all the progress that has been made with gay rights. Hidden Kisses" is a well-made film that it is sensitive. The acting is excellent throughout and it is beautifully filmed. I did find it difficult to believe that a child gets viciously beaten on school grounds and there is no outrage, and little reaction, from parents, teachers, principal or fellow students but that is how it once was and probably still is in small communities. At the center of the film is a father-son relationship that feels very, very real.